Obama has granted the first ever presidential interview to an Arabic television station. He is committed to opening a dialogue with the Muslim world. His campaign for change has had a global impact already. Does change always mean pain? It is a neurological fact that change elicits a fear-based response in the human brain. The sweaty palms, the racing heart, the inner sense of dread — all these things are a part of the normal human existence. The key is to strengthen our consciousness to overcome the neural response. We love order because it gives us a sense of control. Notice that Obama is not using the terms “new world order” as, say, Reagan did. His claim rests in change mixed with hope, not fear; listening and loving, not lamenting and leering. The bodybuilder’s adage “no pain, no gain” does not apply here. We can make a change and a difference. It might involve some level of adjustment, but isn’t that really what life’s about? It might be the fact that I’m turning 40 this year. It might be the fact that I heard Randy Pausch’s monumental speech about achieving your childhood dreams. It might be the fact that change is in the air. I have started a list of things I want to achieve in my lifetime. Some of them are pending while others are in the works. One thing I’ve recently started doing is taking on small speaking roles in TV shows. I always wanted to be an actor. It’s not very time-intensive ( a few hours of work), and it gives me a sense of fulfillment. Now’s my chance. What things do you yearn to do in your life? Perhaps it’s pursuing a hobby you are passionate about. Perhaps it’s stepping onto a new career path. What are you waiting for? Now, more than ever, is the time to embrace change. It is easy to find reasons why you cannot do things: not enough money, not enough talent, not enough time (after you’ve read The Power of Slow, you won’t be using that one anymore!). Dare to be different. Dare to be you. Go out and tell the world who you really are. Then come back and let me know how it went. I really want to know! Ever since I have written the forthcoming book, The Power of Slow, I have taken on a whole new relationship with time. Waiting no longer phases me. In every moment there is something to learn. Yesterday I had to wait an hour in a foyer. I had received a job from my casting agency to appear in a TV court show. Uncertain as to how long the train would take, I arrived an hour early. So I took a moment to chat it up with another extra who had gotten the time wrong herself. I learned she is from Bali and has two children. We shared our views on parenting and passed the time beautifully. Next came the moment when the director came in to hand select a few of the extras to sit next to the main actor of the TV court show. They chose me and a few others. It was exciting and involved more waiting until the make-up artist was free. In fact, the whole day we spent sitting, waiting, and looking interested as the cameras and the actors did their jobs. It was a fascinating experience, one I’d like to do again. In the end, I met a wonderful show regular with whom I exchanged business cards (when not playing a judge, she is an interior designer and architect!). “It is in the waiting that the most wonderful things unfold,” I told her. She smiled widely with a nod of acknowledgment. It appears parents are concerned. As well they should be. Tossing your cellphone-armed kid the keys to the family car is like tossing him or her a six-pack of beer, according to one commentator in yesterday’s Washington Post article about driving safety and banning cellphone usage whilst behind the wheel. It is a topic I address in The Power of Slow. Multitasking has been taken to new heights. Locking cellphones with GPS systems that can detect how fast you are growing is one method of shutting down jabberjaws and thumbless drivers who navigate their vehicles with their knees. The article rightfully points out that other distracting activities while driving, such as downing a three-course meal or applying make-up, are equally dangerous. With our new technological landscape, drive slowly has a whole new meaning. A few more helpful Web sites to keep you informed. The sun lured me outdoors this morning. In fact, being mindful of my carbon footprint, I decided to walk to the country store. The milder temperatures and the encouraging tweets from the trees spoke of the coming warmth. I know it is weeks away, but for the first time since October, I felt a sense that winter is not interminable after all. O come, thy lovely spring! 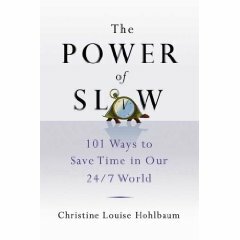 My publisher sent me the catalog copy for my new book, The Power of Slow. I’m thrilled as it is proof it really is going to happen!! My husband and I decided to have a slow morning with a leisurely breakfast and a chat. It made me five minutes late for my workout class, to which I am not accustomed. Usually, I’m at class fifteen minutes ahead of time so it was unusual for me to rush into the overcrowded room and secure the last space in the room – in the front! I smiled throughout the gruelling hour, thinking slow living has its benefits. You may not get a space near a mirror, but how freeing to do things slightly differently! It is evidence that there’s more than one way to skin a cat. Afterwards I chat with an old friend I hadn’t seen in a while. I could tell it did her as much good as it did me to exchange kid stories and to spend a moment connecting. Looking at her watch, my friend suddenly jumped up saying she had talked through her shower time. In the lockerroom another woman commented on how she just needed a day to take it easy and to spend a full thirty minutes getting ready. The power of slow seems to follow me wherever I go. There is something delicious about seizing the moment, pulling the brakes and watching your whole locomotive come to a nice idle. Sometimes it even lands you in the front row!